The player is the main character in Tomodachi Life. It’s you, not any of the bulbous digital people populating the game’s little island. You spend your time directly guiding their lives as the game does away with the fourth wall. The island’s apartment dwellers ask for guidance on everything, even something as paltry as wiping crumbs off their faces. You can craft the whole island population from scratch, detailing not just their physical features and bleepy digital voices, but basic personality traits. Messing around with the game feels more like growing sea monkeys, playing with paper dolls, and chatting up old instant-messaging bots like SmarterChild than anything remotely human. But there is life in there. No matter how much fiddly control Tomodachi gives you in steering its characters’ lives, it always feels impossible to predict what the hell they’re going to do. Chaos is Tomodachi Life’s spice. It’s where all the heat from this pepper of a game lies. Figuring out how to cultivate and nurture that chaos is its greatest reward. That disarray reveals itself quickly. Tomodachi is immediately surreal. It asks you to make a Mii—those bobbleheaded custom avatars. This Mii, says Tomodachi, is supposed to be you but not you. Okay. You-but-not-you is the first resident of Tomodachi Island. My little fella, Tony Olds, wanted to be fed as soon as he arrived, so I trundled off to buy him a veggie burger, which appears as a photorealistic object in the minimalist cartoon art of the game. As I fed it to the spooky but affable Tony, the picture of the veggie burger shrank while scarfing noises befitting Garfield played. Tony Olds’ happy meter was filled, and then the game gave him some money. This is the central rhythm of the game. Make characters, go to the Tomodachi Island apartment complex, look for residents who have a problem, solve that problem, get cash, repeat. It seems dull at first, but Tomdachi‘s to-do list soon beguiles. Female Salman Rushdie wants a new hat! But I’m strapped for cash. Kyle MacLachlan is hungry! So I feed him fried calamari, which turns out to be his favorite food, causing him to dance like ’50s Elvis and level up in happiness. I gift my little Kyle a new Asian-themed apartment before going off to buy a bowler hat. Salman Rushdie ends up loving the hat. Her happiness goes up, too, and she starts dating Charles Barkley in Room 102. So the game opens up a theme park for them to play in. When they get married, it opens more apartments, they have a baby, and I get more cash to buy food and hats for everyone. Chaos. Were that all of Tomodachi Life’s amusements, it would be a pleasantly odd descendant of the soundalike relic Tamagotchi. The details that flavor the game’s core activity are so goofy and unpredictable that simply making stuff happen becomes a more captivating pastime than trying to help people. You can, for example, peek into characters’ dreams, watching as one of the Miis imagines herself as a bobblehead doll affixed to the dashboard of her neighbor’s car, driving endlessly on a blank road. Sometimes they dream they’re snails and wake up to give you a plate of escargot to be delivered to their best friend. On occasion, your residents do random news reports about face stretching competitions. Had Rene Magritte made Little Computer People rather than David Crane, it might have looked something like Tomodachi Life. 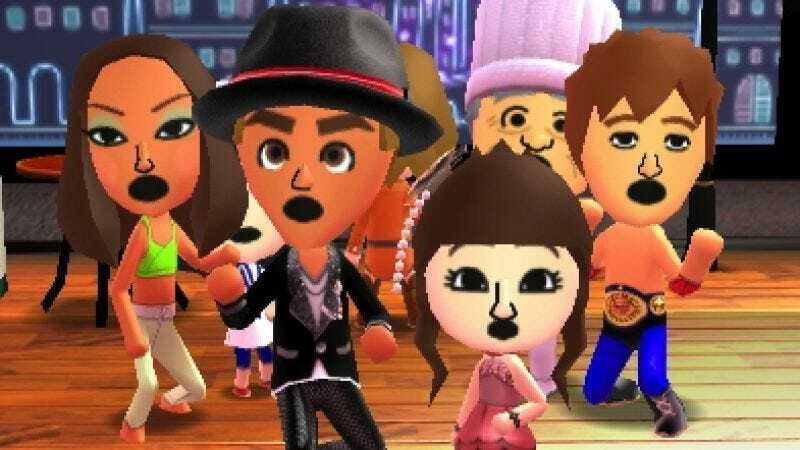 If there’s anything holding Tomodachi back, it’s the limits of its cultural perspective. Nintendo had been reticent to release this game and its predecessor outside of Japan, and playing it certainly demonstrates why. The foods, fashions, and leisure activities are all firmly rooted in middle-class urban Japanese culture and fiction. Doling out fresh spring rolls to a character that’s plotting a love confession before going on a Cambodian vacation is a scenario born of a specific experience. Fortunately, Tomodachi’s rich strangeness isn’t derived purely from the exotic. The game’s just weird, but it might have benefited from an even broader cultural palette. On the other hand, specificity is central to Tomodachi Life‘s invigorating chaos. How you make your characters, which characters you choose to pull in using their creator’s QR codes, what you feed them, when you play with them—all of these choices matter. Those decisions fuel whatever nonsense Tomodachi ends up spitting out while you play. The winner, as Napoleon Bonaparte said, will be the one who controls the chaos. Why suddenly bring up Napoleon? Shut up, look over there, eat a fish stick, and perform a choreographed dance number in the town square. What? Huh? Precisely.